Area : 6.5 sq. km. Temperature : Max. 43°C and Min. 23°C in Summer. Max. 28°C and Min. 11°C in Winter. Rainfall : 60 cms to 85 cms. Chittaur is the pride and glory of Rajasthan. It echoes with the tales of romance and valour unique to the Rajput tradition. 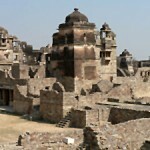 A ruined citadel, where the royal past lives in its imposing forts, graceful palaces and spectacular chhatris. Alauddin Khilji was the first to sack Chittaur in 1303 A.D., overpowered by a passionate desire to posses the regal beauty, queen Padmini. Legend has it, that she saw her face in the reflection of a mirror and was struck by her mesmerizing beauty. But the noble queen preferred death to dishonour and committed ‘Jauhar’. Chittaur was never inhabited again but it always asserted the heroic spirit of Rajput warriors. Beautiful forts, palaces, temples, victory tower, museum, wildlife sanctuary and splendid view of hilly region are the major tourists attraction. Air: Flight services are available from major cities of India. Nearest airport is Dabok, Udaipur, 90 km from Chittaurgarh. Rail: Chittaurgarh is well connected by rail. Good train services are available from the major cities of India. Road: Bus services operate to several important destination of India. Local Transport: Unmetered auto-rickshaws, cycle-rickshaws and tongas. 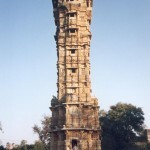 Vijay Stambh (Victory Tower): The Stambh was built by Rana Kumbha in 1440 A.D., to commemorate the victory over the Muslim rulers of Malwa and Gujarat. This imposing 37 mts high tower with nine storeys, covered with exquisite sculptures of Hindu deities and depicting episodes from the two great epics, Ramayana and Mahabharata. 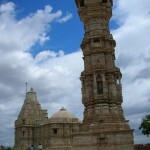 Kirti Stambh (Tower of Fame): This tower is 22-meter high built in the 12 century A.D. by a Jain merchant. 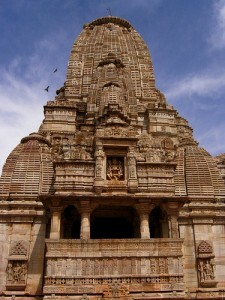 This tower is dedicated to Lord Adinathji, the first Jain Tirthankar. Government Museum: The magnificent Fateh Prakash Mahal has been converted into a museum, which is a rich collection of sculptures from buildings and the temples in the fort. Entry fee is required. Closed on Friday. Padmini Palace: Built beside a pool, the palace is a magnificent one. It was here that Rana Ratan Singh showed a glimpse of queen Padmini to Alauddin Khilji. Rani Padmini stood in a ‘Zanana Mahal’, a pavilion in the centre and her reflection was visible to Alauddin Khilji in a mirror placed in the main hall. After having a glimpse of the legendary beauty, Alauddin went to the extent of ravaging Chittaur in order to possess her. Rana Khumbha Palace: The ruined edifice of great historical and architectural interest, being the most massive monument in the fort of Chittaur. The palace is believed to have underground cellars where Rani Padmini and other women committed Jauhar. Jaimal and Patta Palaces: The ruins of palaces of Rathore Jaimal and Sisodia Patta are witness to the gallantry of these great warriors. Kalika Mata Temple: This temple was originally a sun temple in the 8th century, which was converted into Kalika Mata temple in 14th century A.D. dedicated to Goddess Kali, the symbol of power. 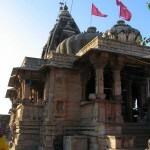 Kumbha Shyam Temple: Built during the reign of Rana Kumbha in the Indo-Aryan style, the temple is associated with the mystic poetess Meera Bai, an ardent Krishna devotee. She was wife of Prince Bhojraj. The Fort: The indomitable pride of Chittaur, the fort is a massive structure with many gateways built by the later Maurya rulers in 7th century A.D., an example of the Rajput architecture. Perched on a height of 180 mts high hill, it sprawl over 700 acres. The tablets and chhatris within are impressive reminders of the Rajput heroism. The ancient ruins of the fort are worth spending few moments in solitude. Meera Bai Temple: The temple where Meera Bai worshipped Lord Krishna is built in north Indian style on a raised plinth with a conical roof and beautiful inner sanctum. An open colonnade around the sanctum has four small pavilions in each corner. Gardens & Parks: Pratap Park, Meera Park and Nehru Park are beautifully laid out parks in lash surroundings. Beautiful Khwaja rose garden at Sawa is just 13 km. from Chittaur. Nagari: Nagari is situated 20 km from Chittaurgarh, on the bank of river Bairach, the oldest towns of Rajasthan during the Mauryan period. It is an ancient town of archeological importance. 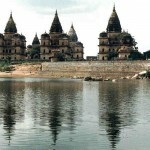 The Hindu temple and structures of Buddhist monuments remains from the Mauryan and Gupta period are found here. Bassi: Bassi is situated 25 km from Chittargarh. 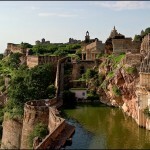 Enroute Bundi is a marvellous village with historical forts, temples and Kunds. Especially famous are its sculptures and woodcraft. A place of great tourist interest. 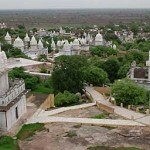 Bijaipur: Bijaipur is situated 40 km from Chittaurgarh. A marvellous castle built by Rao Shakti Singh, the younger brother of Maharana Pratap, stands in the village. Presently, it has been converted into a heritage hotel. This entry was posted in Chhittaurgarh, Rajasthan and tagged Bassi, Bijaipur, chittaurgarh fort, Chittaurgarh map, forts, Government Museum, Jaimal and Patta Palaces, Kalika Mata Temple, Kirti Stambh, Kumbha Shyam Temple, Meera Bai Temple, Nagari, Padmini Palace, Palace, palaces, rajastan, Rana Khumbha Palace, The Fort, Vijay Stambh. Bookmark the permalink.